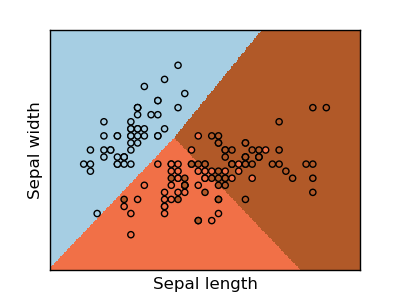 Show below is a logistic-regression classifiers decision boundaries on the iris dataset. The datapoints are colored according to their labels. X = iris.data[:, :2]  # we only take the first two features. # we create an instance of Neighbours Classifier and fit the data. # point in the mesh [x_min, m_max]x[y_min, y_max].